A couple of years ago, Drosera VZW, the Belgian carnivorous plants society, organized a trip to Carniflora, a CP producing company in Aalsmeer, the Netherlands. Since most of my Dionaea’s died after a terrible winter (I kept them outside, they normally survive most of our wet winters), I decided to give them another try in May 2007 and bought several young plants, seemingly looking quite the same. Back home, after having a closer look at my purchase, I discovered a somewhat small plant with distinctively different leaves; they were “winged”. During its maturation, I discovered the variability of this peculiar plant. The variability ranges from leaves with normal traps to leaves with double traps (see Figure 1), and everything in between (little “wings” or even “cups” on each side of the trap (see Figure 2). Double traps are formed in the beginning and the end of a growing season. One year later, Dirk De Troyer, the treasurer of our CP society, came to visit my collection and was amazed by this special Venus Flytrap. Together, we decided to name it ‘Mirror’, after the striking symmetry of the double traps. The second trap produced on the back of the normal one is not active. 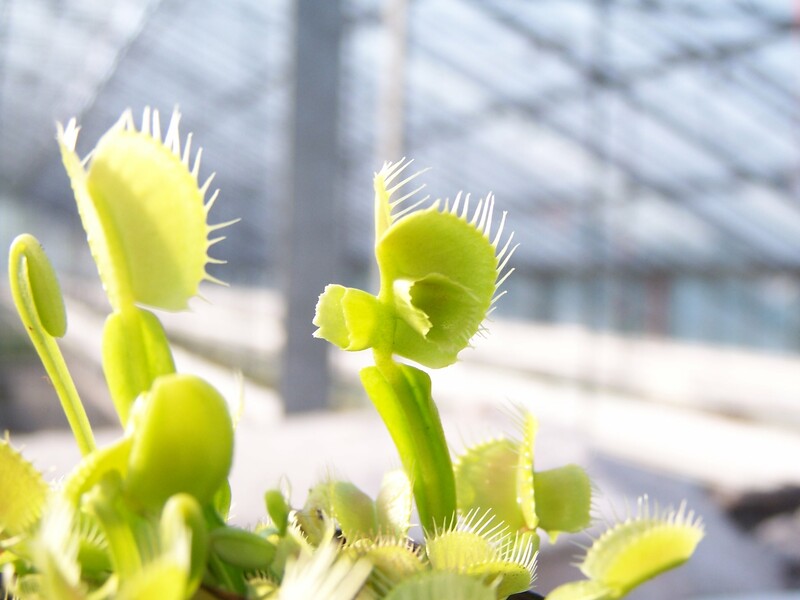 Dionaea ‘Mirror’ has no other distinctive characteristics besides its traps. It grows and flowers quite normally. I propagated many plants over time, but always in a vegetative way. The standard pictures first appeared in Drosera VZW Nieuwsblad 19 (2), 2008. Reproduced with permission. 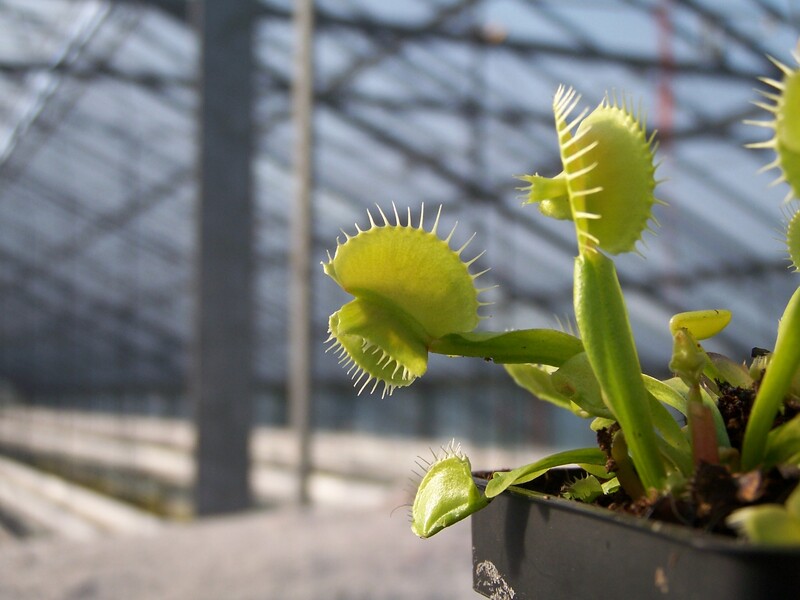 Figure 1: Sideview on a Dionaea ‘Mirror’ double trap. Figure 2: Back view on a Dionaea ‘Mirror’ trap with “cups” on each lobe of the trap. This plant was an intentional hybrid created by me in May of 1999, and is a selection of Sarracenia oreophila × Sarracenia rubra subsp. jonesii. S. oreophila was the receptive flower and seed producer. On 28 May 2007, I coined the cultivar epithet ‘Mountain Splendor’ for this delightful plant. Both parents of this cultivar are of mountain origins in Alabama (for S. oreophila) and North Carolina (for S. rubra subsp. jonesii). Its subtle colorations, profusion of flowers, and stately stature truly make it a splendor to behold. In the early season, flowers and pitchers open at nearly the same time. Depending on rhizome size, a 1.2-cm division can have about 3 crowns, and will produce 5-7 pitchers ranging in size from 4 to 8 cm. Pitchers are green with golden hues interlaced with red veins. This first crop of leaves tend to have the robust round appearance of S. oreophila, with a slight flaring of the lids as seen in the S. rubra subsp. jonesii parent. Production of these pitchers continues usually to the end of June depending on temperatures. Taller leaves often become floppy, but are often replaced with new ones. Growth slows some in the mid-summer heat, but resumes again in the cooler temperatures of late August (in Oregon). This next set of pitchers are usually shorter in stature (4.7 cm or less), have heavier red veining, and darken as the weather cools in late September similar to the S. rubra subsp. jonesii parent. Late summer and fall also brings production of recurved phyllodia similar in appearance to S. oreophila, but much smaller. Flowers on this plant are prolific and showy. A roughly 3-year-old plant from a 3- or 4-crown division can produce 12 to 13 flowers. Petals range in color from peach colored to lipstick red, and sepals tend to be two-tone red and gold before petal drop. Flowers are roughly 0.8 cm across – about half-way in size between the parents. They are strongly scented with a sweet almost Easter Lily-like scent. The plant fairly consistently produces open pitchers and flowers simultaneously, increasing the overall aesthetics. A couple of other features are of note with this plant. One is its cold hardiness. Since both parents are of mountain origin (USDA zone 7a), it is remarkably cold hardy. Our plants have survived short periods of -5°C with only a tarp for protection. The other feature of note is the vigorousness of the growth. This plant consistently doubles the size of its rhizome mass each season. It also lends itself to easy division for propagation due to fast growth of crowns. The plants were planted together in 2008, one each of the parent clones and a ‘Mountain Splendor’ (see Figure 3). The S. oreophila and ‘Mountain Splendor’ were similar-sized rhizomes. The S. rubra subsp. jonesii was a two-crown division. Flowers of all three can be seen, and the dramatic growth rate of the ‘Mountain Splendor’. 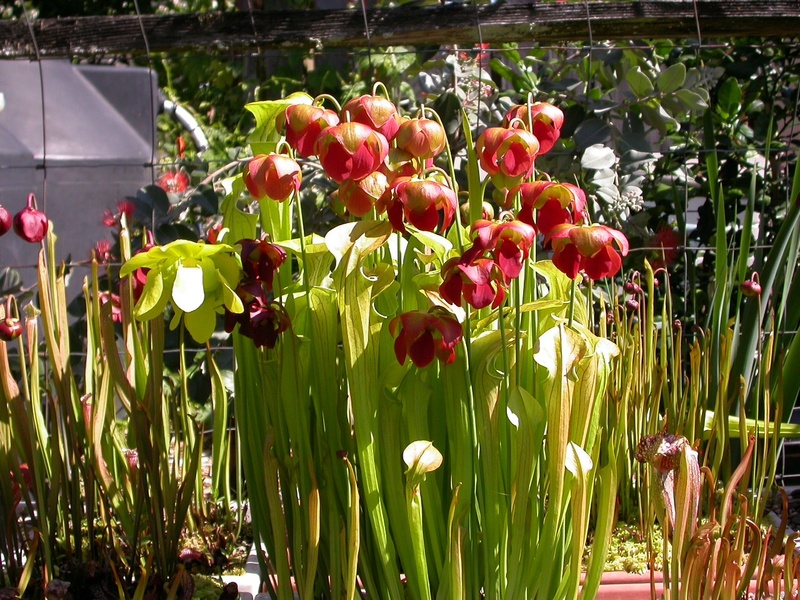 Figure 3: Sarracenia ‘Mountain Splendor’ (center) growing with Sarracenia oreophila (plant to the left) and Sarracenia rubra subsp. jonesii (dark red flowers to the lower left). Photograph by Jeff Dallas. The Group consists of perennial plants with short and unbranched shoots. Members of this Group form a flat rosette, with short, white, unbranched roots. The affinities to P. cyclosecta and P. debbertiana are well recognizable. The winter leaves are blunt, spatulate and with weak hairiness, forming rosettes 3.5 cm in diameter of about 50 leaves. In mid-March the summer rosettes appear which are intermediate between P. debbertiana and P. cyclosecta, but slightly closer to the latter. The summer leaves are glandular hairy and a little bit thinner than the winter leaves. The coloration varies between orange-pink and purple. Until now two different cultivars belonging to this Group were identified, both with very similar leaves, but with different flowers. The flower of P. ‘Jannes’ is more similar to P. cyclosecta (see Figure 4). The upper corolla lip consists of two round lobes; the lower lip has three round lobes that overlap partially. The color is identical to P. cyclosecta, perhaps a little more purple. The veins are darker and go from the throat up to the tips of the lobes and can also be seen on the spur. The throat has a white, somewhat greenish coloration and has some veins. The typical yellow hairs of P. debbertiana are present, but not as clearly distinct as in this species. The flower of P. ‘Bettie’ is quite different from P. ‘Jannes’ (see Figure 4). The coloration is paler and the corolla lobes are longer, with rounded edges. They are narrower and do not overlap. In the place of the yellow spot of P. debbertiana there is a white one, but with no or very weak hairiness. Weinberger, C. 2009. Pinguicula debbertiana × cyclosecta - Ein neuer Kulturhybrid. Das Taublatt 2009/2: 5-8. Figure 4: Comparison of Pinguicula cyclosecta (left), P. debbertiana (right), P. ‘Jannes’ (middle left), and P. ‘Bettie’ (middle right). Reproduced with permission from Das Taublatt, vol. 2009/2, p. 8.